Who wouldn't be happy unwrapping their very own Micro Scooter? They are one of this season's most loved gifts. But don’t just take it from us! We’ve rounded up some of the best 2018 gift guides from publications and blogs naming Micro as one of their top picks for the holiday season. Keep reading to discover why so many are choosing Micro! Jen created multiple gift guides via Amazon's shopping lists and many include our scooters! Our Maxi Deluxe scooter is featured in her guide for 6 year olds and guide for 5 year olds, while our Mini Original kick scooter is listed in her guide for 3 year olds. While we’ve discontinued the Mini2Go that she recommends for 1 year olds, we’ve upgraded the design and carry 2 options for 12 mos through 5 years: our Mini 3in1 Deluxe and Mini 3in1 Deluxe Plus. Both perfect for learning how to sit and scoot! Jen includes our Mini 3in1 Deluxe in her gift guide for 2 year olds, but we’ve found that at age 2, children enjoy standing to scoot. However, if you feel that your little one could benefit from a seat as they learn to ride a scooter, the seats on our 3in1 scooters hold up to 30 lbs. Sara Foster of Barely Famous (and new head of creative for Bumble BFF & Bumble Bizz) shares her top picks for holiday gifts with online retailer, Maisonette. Among her girl-power-packed picks sits a pink Maxi Deluxe scooter. 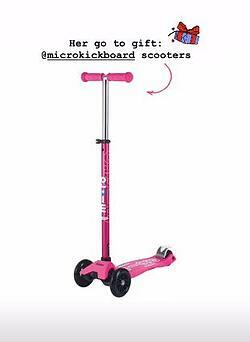 In Maisonette's Instagram stories, they mention that Micro scooters are Foster's go-to gift. We don't blame her! Who wouldn't love a Micro sitting under their tree? One Micro feature we like to highlight is the non-marking wheels on Mini and Maxi models. If you think your child can only ride outside, think again! Our thick, PU wheels are perfect for indoor play as well. The Micro Mini Deluxe scooter was included in June and January's Holiday Kiddo Gift Guide! They call this the ultimate lineup of gifts for any kiddo. What little one doesn't love scooting around?! Newbie on the blogging block (website on the way! 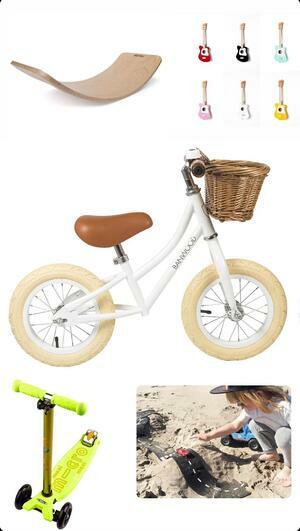 ), Birdie Interior, put the cutest gift guides for kids ages 0-7 on their Instagram feed. Our Micro Mini Deluxe scooter was featured in their Gift Guide for Boys Ages 2-5. Our scooters come in a wide range of colors that appeal to any child. And with a lineup of fun accessories, you can personalize your Micro to fit your little one’s interest. Ilana Wiles, the mastermind behind the blog Mommy Shorts, featured us in her series of Gift Guides: 87 Gifts for the People I Love. 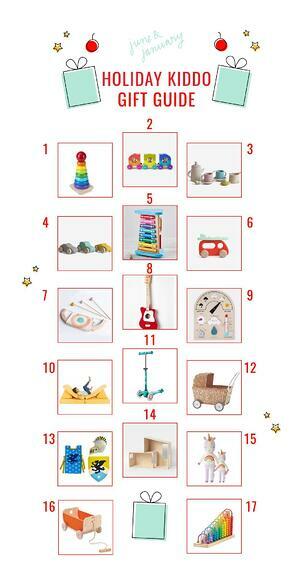 Our Micro Maxi Deluxe scooter is featured right smack dab in the middle of the gift guide for her daughter, Harlow. Ilana notes that the items on this list are great for “any small but mighty 6 y/o who loves Barbies, music, building, scooting, fairies, and surprises.” She also featured our Unicorn Scootaheadz attachment which can often be seen on the @momyshorts Instagram tagging along on Harlow’s scooter! Exactly as their name stares, the site Athletic Minded Traveler connect those with an interest in healthy lifestyle and travel. We were thrilled to be featured in their Holiday Gift Guide for 2018! Led by best-selling author, accomplished corporate entrepreneur, and former nationally-ranked and sponsored triathlete, Jim Kaese, Athletic Minded Traveler is a well-respected source for all things health and fitness. Jim is "widely recognized as the leading authority in the healthy-travel marketplace. Active.com and Triathlete have claimed him as their “travel expert”, Health has recognized him as a “Healthy Hotel Expert”, and other national/international media frequently solicit Jim’s opinions on travel and fitness trends, including the Washington Post, USA Today, MSNBC, Chicago Tribune, Forbes, Self, and many others." The team at Athletic Minded Traveler featured the Micro Pedalflow in their Holiday Gift Guide, naming it as a top gift for "the urban dweller or person who likes to park and GO!" They had some kind words to say about Micro's trusty steed: "Yes, bike and scooter shares abound these days, but sometimes you want your own ride and you want it to be low-maintenance. This is where the Pedalflow from Micro Kickboard comes in. 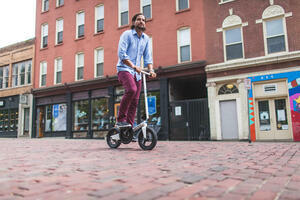 It's a seat free bicycle that folds down easily so you can take it wherever you go." 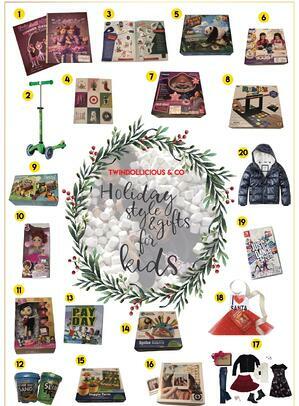 Natasha from TwinDollicious included the Micro Mini Deluxe in her guide to Holiday Gifts and Style for kids. She says on her site that she appreciates brands that influence people to live their best lives, surely one of the reasons she chose Micro to be on her list! She calls us one of the "essential learning toys for toddlers." Natasha, we're flattered! Brittany from The Ashmores Blog put together a toddler gift guide of everything she's getting for her little one, Leighton this year. On it, our Micro Trike! Perfect for kids ages 18 mos+, the Micro Trike is foldable and portable. It makes it easy to ditch the bulky stroller! Brittany says she loves the Trike because "it's lightweight and folds up easily! It’s under $100 too!" We love seeing when other industry experts, and parents alike recommend our products. Have you seen us on a gift guide? Let us know! Wondering which scooter is the perfect fit for someone in your life? Check out our Online Concierge.